Cancer. It’s a diagnosis that no one wants to hear. It can leave you feeling frightened, uncertain, and powerless. But if you or a loved one is facing cancer, it’s important to have hope. In many cases, cancer can be cured, especially when it’s detected early. There are more treatments available now than ever before to cure cancer or slow it from spreading, relieve its symptoms, and help you live a healthier life. Fifty years ago, when my father received the diagnosis of Hodgkins Lymphoma, it was devastating and terminal. Our small town doctors were unfamiliar with the early symptoms and so it went undetected until the symptoms became relentless enough to send him to a specialist. By then it was in the 4th stage, and although all efforts were made, the cancer won out. Had my father been diagnosed today, not only would it have been caught so much sooner but the prognosis would have been excellent! At a recent oncology conference I attended, one of the speakers called Hodgkins Lymphoma “the cadillac of cancers” because it was ultimately “curable”. Breast cancer affects 1 in 5 women, prostate cancer 1 in 5. Lung cancer is the most common cancer for both genders and colon cancer affects 1 in 18 men and 1 in 20 women. Yet, with modern research, more people than ever before are triumphant over that diagnosis. Gene research has promoted the development of targeted chemotherapy with fewer side effects and greater successes than the previously used drugs that destroyed so much of the body’s healthy tissue and immune system. But no matter how targeted these drugs are that do battle with cancer, they also go to battle with the body. At the 2013 MD Anderson Oncology conference for Acupuncturists in Houston, many of the MDs that spoke were unequivocal about the toxic effects of the drugs they used. It is precisely because of this they felt so strongly about giving the body support during this time to combat not only the cancer but the side effects of the chemo agents. It is with greater frequency, we in the complementary field of Oriental Medicine are being called upon and referred to by Oncologists and Medical Doctors in every field to aid in the healing process. 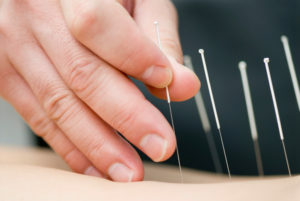 Acupuncture has been shown and in many cases proven through double blind studies to be one of the best adjunctive (complementary) therapies in holistically aiding the body to combat this disease. But perhaps even more important is it’s role in reducing stress and promoting well being during the roller coaster ride to full recovery. Many cancer patients benefit immensely from acupuncture’s ability to improve mood due to the release of endorphins and regulation of seretonin levels that this therapy provides. Frustration and depression both can be treated and alleviated with Oriental Medicine. Strengthen what is correct, fortify and support the body to make it stronger and more resistant to disease. “Between Heaven and Earth — is it not like a bellows? When emptied, it is still inexhaustible. It is this basic principle that drives Oriental Medicine’s approach to holistic healing – “Restoring the Harmony” of the body. This, in turn, gives rise to inexhaustible vitality and wellness!